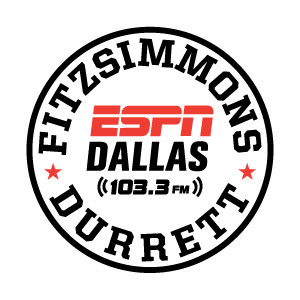 Ian Fitzsimmons and Richard Durrett bring their brand of sports talk, expertise of local teams and humor to ESPN Dallas 103.3 FM. Rangers GM Jon Daniels joins Fitzsimmons and Durrett to tackle the tough questions after his team failed to advance to the playoffs. Dallas Mavericks coach Rick Carlisle joins Fitzsimmons and Durrett at Mavericks media day to discuss his expectations for the upcoming season. Following Dallas' loss to San Diego, Richard Durrett, Chuck Cooperstein and Landry Locker discuss the Cowboys' pros and cons. Former Cowboy and ESPN NFL analyst Darren Woodson joins Fitzsimmons and Durrett to discuss Sunday's Cowboys-Chargers game. ESPN Insider and senior MLB analyst Jim Bowden joins Fitzsimmons and Durrett to discuss the wild-card race and the Rangers' chances of making the playoffs. Richard Durrett shares his jury duty experience from the trial he just finished serving on. Ed Werder joins Fitzsimmons and Durrett to discuss the mediocrity of the NFC East, the importance of the Cowboys' game in San Diego and more news from around the NFL. Chuck Cooperstein joins Ian Fitzsimmons and Tim MacMahon to discuss why he feels Rangers pitcher Yu Darvish isn't an ace. Glenn "Stretch" Smith joins Ian Fitzsimmons and Tim MacMahon to discuss the impact Anthony Spencer's injury will have on the Cowboys. Could we see more Jason Hatcher at end? The guys discuss. Nate Newton joins Ian Fitzsimmons and Tim MacMahon for Overreaction Monday to discuss the Cowboys' dominant win over St. Louis and preview their upcoming game in San Diego. Herm Edwards joins Ian Fitzsimmons to vent his frustration with the Cowboys and discuss what has caught his attention two weeks into the NFL season. Ed Werder joins Ian Fitzsimmons and Tim MacMahon to discuss the Cowboys' ineffective running game, Anthony Spencer's knee injury and the Trent Richardson trade. Louis Riddick joins Ian and Tim to discuss Johnny Manziel's draft stock, why the Cowboys have been unable to run the ball and what he thinks of Tony Romo's increased involvement two weeks into the season. Ron Washington joins Ian Fitzsimmons and Tim MacMahon to discuss the Rangers' dismal September, who's to blame for their September struggles and his status as the team's manager. A disgusted Nate Newton joins Fitzsimmons and Durrett to vent about the Cowboys' loss in Kansas City and discuss what caught his attention in Week 2. Fitzsimmons and Durrett discuss how some people are calling for the Rangers to fire manager Ron Washington. In one of the most entertaining Locker Rooms ever, Landry Locker talks about his Thursday night date that didn't go how he had hoped. Darren Woodson joins Fitzsimmons and Durrett for his weekly visit to discuss what he took away from the Cowboys' win over the Giants and break down what the Cowboys need to do Sunday in Kansas City. Jim Bowden joins Fitzsimmons and Durrett and attempts to solve the Rangers' problems. Jayson Stark joins Richard Durrett to give his thoughts on the AL West race, Matt Garza's struggles, the wild-card race and more. Part 2 of the articles on OSU's involvment in academic fraud was released. Some claim the expose is unfounded. Ian and Richard warn that there are two sides to all stories. Fitzsimmons and Durrett discuss the Cowboys' season opener that included injury scares from Tony Romo, Dez Bryant and Morris Claiborne. Fitzsimmons and Durrett discuss Mack Brown, Manny Diaz and all the latest with the Texas Longhorns. Michael Young joins Fitzsimmons and Durrett to catch up and discuss if he still follows the Rangers, his fascination with fantasy football and much, much more. Darren Woodson joins Fitzsimmons and Durrett to preview the Cowboys' season opener against the Giants and give insight on what it takes to build a winning culture. Jim Bowden joins Fitzsimmons and Durrett to discuss what the Rangers need to do to grind out the AL West, what he sees when he looks at Yu Darvish right now and a lot more.